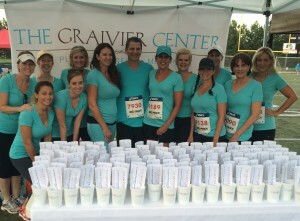 Dr. Graivier was honored to be able to support such an amazing cause. The entire staff at The Graivier Center was in attendance showing their support. Many of the team members ran alongside Dr. Graivier and his wife, while others cheered on the hundreds of runners that participated. Before and after the event, the staff was on hand to answer questions and give out goodies to everyone who stopped by The Graivier Center’s tent.